Title Text: "I&#39;m working on assembling a combination declinometer, sclerometer, viscometer, aleurometer, stalagmometer, and hypsometer. I&#39;m making good progress according to my ometerometer, a device which shows the rate at which I&#39;m acquiring measurement devices"
sarcasmometer. Pronounced "sar-cazz - MOMeter"
A rarely-used device due to a propensity to destructive input overload. My firstpostometer, however, indicated a number of errors with the post I'm replying to, so I'm putting a good version here until Mods can work out what to do. Hey, I sorta like those &..; thingies; they bring out the inherent kludginess of HTML, as well as the low quality of the software behind most sites like this. The software isn't low-quality. It's rendering input text as it was input, by way of the route that other truly literal text has to travel via HTTP's sending and retrieval paths. Formatting markup is deliberately BBCode, not HTML. It's possible that it might be told to directly use <em>some</em> web hypertext stuff (did it?) and can be filtered to make it BBCode in the 'official' plaintext copy ready to be backconverted, but once we start with conversions and back-conversions we're also liable to see abominations such as &amp;amp;, &amp;cetera, because of changing ideas of literalism. Edit: Whoops! I just overloaded my explanometer! And the em-tag wasn't passed through 'naturally', but was (quite rightly, on general principle) protected against by making it the literal text (via &lt; and &gt; conversion) it was deemed to need to be. Always be suspicious of people who are using speedometers at the beach. My I interest you in this book of poetry in Iambic Pentameter? I have a large collection of nanometers I'd be willing to share. In one of my calculus classes, the professor offered us extra credit on an assignment if we could name a device used for direct measurement of arc length. He refused to accept my response of "opisometer", even after I brought one, in its case, to class. Seriously, though, a micrometer is a thing (for measuring in the micrometre range), so why shouldn't there be a nanometer? (I guess British English is unusual in having distinct spellings. Other languages tend to go for -er or -re for both the unit and the instrument. It's almost as though we want to be both in and out of Europe at the same time...). So my "caliper" should be a "centometer". Or maybe a "millometer". Heimhenge wrote: So my "caliper" should be a "centometer". No, a centometer counts low-denomination coins. And a millometer counts grain processing plants. This comic has to be directed towards me. I own multiple micrometers, a chronometer and really really want a barometer. Not the electronic kind but a real, honest to goodness mercury stick one. And the chronometer, a 1940's Hamilton Watch Company made one, is one of the most beautifully made mechanical clocks every made. ucim wrote: No, a centometer counts low-denomination coins. And a millometer counts grain processing plants. Those dollar-store millometers are a waste of money. On the other hand, a professional grade millometer will take the quality, size, and duty cycle of the mills into account. I can't wait until advances in technology allow megameters to be miniaturized to the point where we can all have one in our garages. The BBC has been broadcasting the ads for decades, but these things always seem to remain another 20 years away. SuicideJunkie wrote: I can't wait until advances in technology allow megameters to be miniaturized to the point where we can all have one in our garages. That explains a lot of politics. The US media has been deploying magameters instead. J%r wrote: I have a meter that measures a character in Star Trek: DS9. 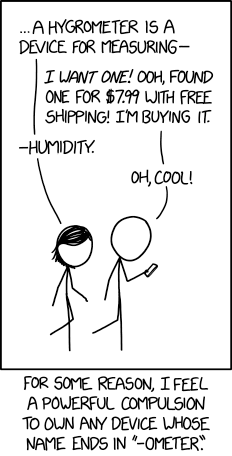 That'd be a Mil(esO'Brien)ometer, yes? Or does one perchance mean someone, if not -thing, else? which contains the phrase "well-known chemical actinometers potassium ferrioxalate and o-nitrobenzaldehyde"
If Randall needs to own anything with "ometer" in the name, he'd better get friendly with a chemical supply house! On the other hand, he did specify "device" and it's arguable whether (most) chemicals are devices or not. My nogometer only gets used around New Year's Eve. I heard of a proposed design my a Yattometer to measure how Louisianan someone's speech patterns are, but the whole thing was more than I could take in. From people who, instead of asking "Where are you?" ask "Where (are) you at?" and pronounce it "We're yatt." orthogon wrote: (I guess British English is unusual in having distinct spellings. Other languages tend to go for -er or -re for both the unit and the instrument. It's almost as though we want to be both in and out of Europe at the same time...). You do the Hokey Pokey and you turn yourself around. That’s what it’s all about. ijuin wrote: You do the Hokey Pokey and you turn yourself around. That’s what it’s all about.